WebTrax provided Arcadia with website design services. 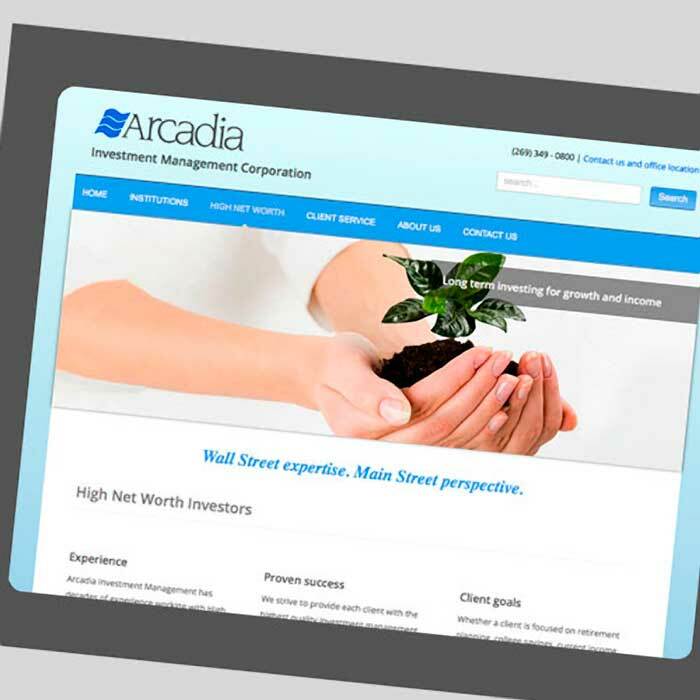 Arcadia Investment Management is a Kalamazoo, Michigan, based asset management firm, specializing in working with both institutional investors and high net worth individuals. Their challenge in redeveloping their website was to ensure their message was effectively articulated to both of these core audiences. While all investors want to grow the value of their investment portfolio, institutions and individuals typically go about doing so differently. As such, their messaging and website design required a distinctly different approach in order to be effective. Working closely with Arcadia’s portfolio management and client services teams, WebTrax and communications consultant, Daniel Quinn Communications (DQComm), developed a new message around which the rest of the content strategy and subsequent technical build-out of the website would be based: “Wall Street expertise. Main Street perspective”. DQComm created what were in essence, two separate content strategies tailored to each of Arcadia’s core constituents. 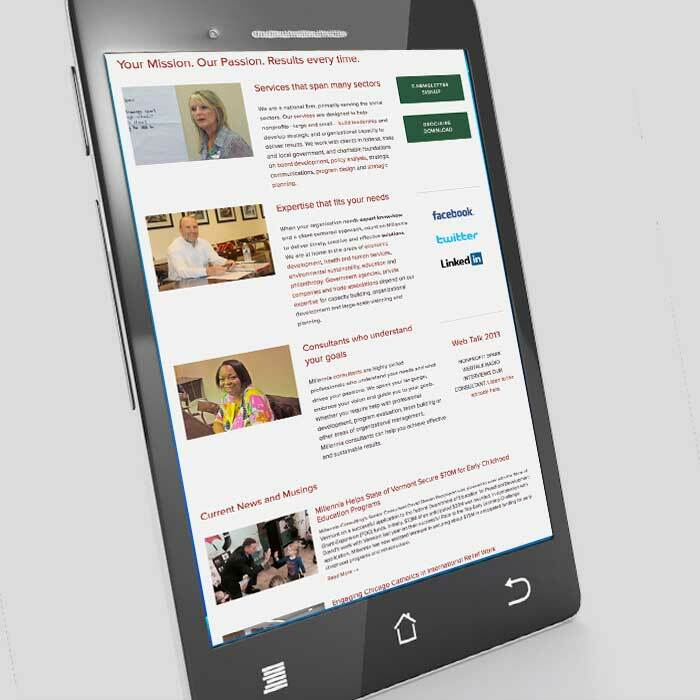 While DQComm finalized the content strategy and composed the writing for Arcadia’s new website, Webtrax designers worked in tandem to select images and graphics consistent with the new message while WebTrax developers constructed Arcadia’s new mobile responsive website in the Joomla! CMS. Read more about WebTrax website design services. View more of our case studies. 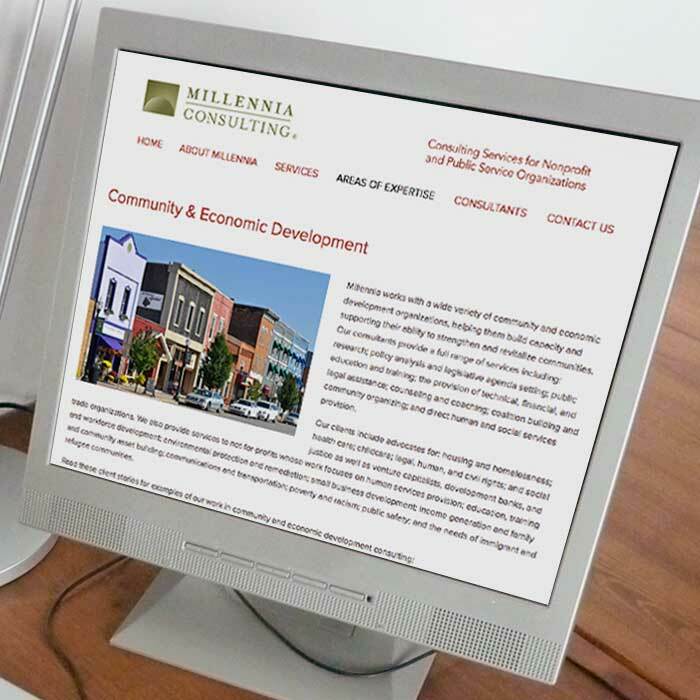 WebTrax provided Green Community Connections with our website design, graphic design, and branding services. Green Community Connections is a volunteer-driven community organization whose mission is to develop a deeper understanding of natural systems, build community, and inspire change that promotes sustainability at the family, organizational and public policy levels. WebTrax became involved from ground zero, creating a WordPress website in 2011 with a homepage blog, a calendar for community sustainability events, and a page of resources, educating the public about specific measures they can take to conserve energy or take action on climate change, for example. In 2013, WebTrax launched an upgraded site for Green Community Connections, improving the overall appearance. A sidebar allows viewers to sign up for a monthly email newsletter or view a related YouTube video, while social media buttons make it possible to instantly follow Green Community Connections on Facebook, Twitter, and YouTube. Along with the website upgrade, WebTrax developed all the logos and branding for GCC as well as handouts, brochures, and posters. 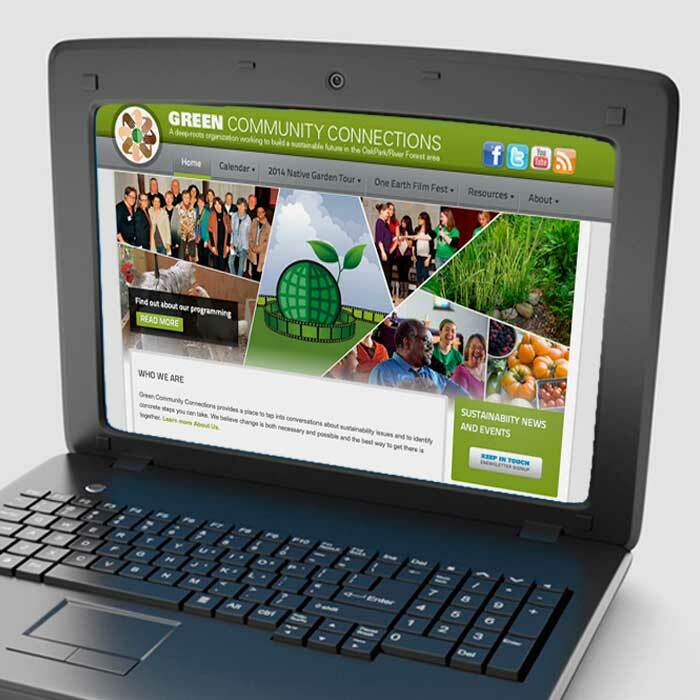 As Green Community Connections evolved, the website also expanded. 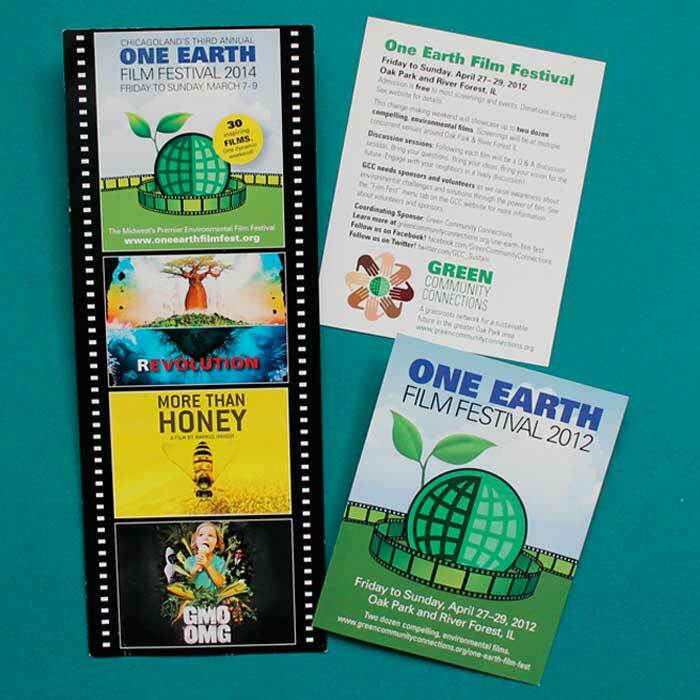 WebTrax added sections for two annual events, the One Earth Film Festival in the spring and a Native Garden Tour in the fall. A drop-down menu for each of these events allows people to quickly find information about films and tour sites with locations. WebTrax has learned along with developing a great relationship, the developmental needs of an increasingly expansive website and promotional materials. Read more about WebTrax website design, graphic design, and branding services. View more of our case studies. WebTrax provided Open Communities with graphic design services. 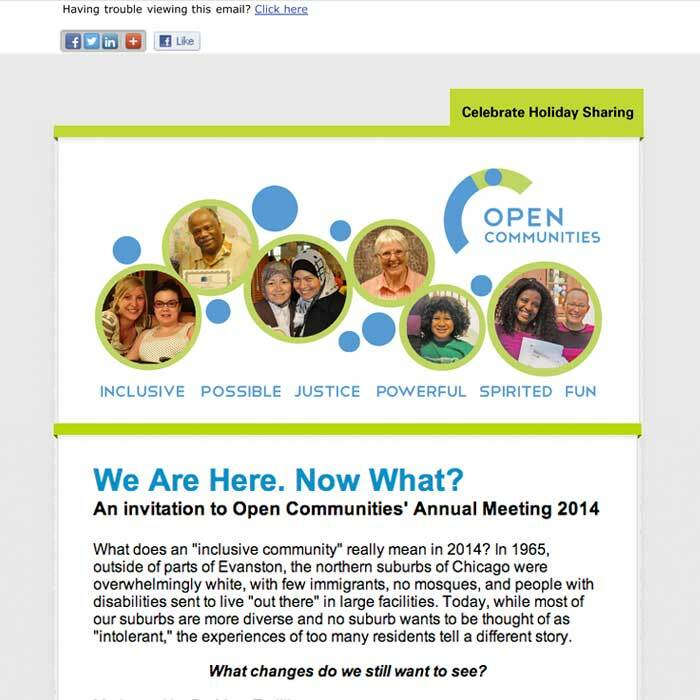 In 2012, Interfaith Housing of the Northern Suburbs changed their name to Open Communities. Due to this rebranding, Open Communities reached out to WebTrax in the fall of 2012 to design materials that reflected the new logo and overall image. 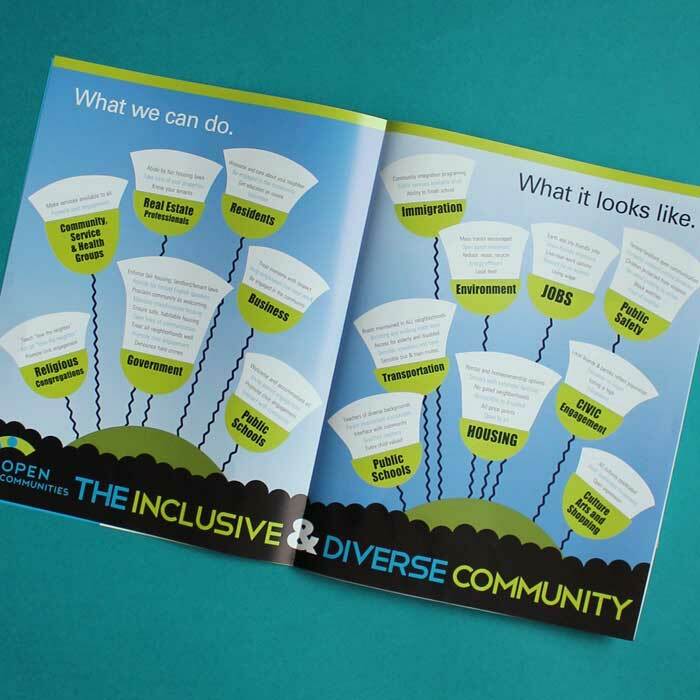 This redesign work included brochures, newsletters, handouts, and any auxiliary materials that Open Communities needed. All of these materials needed an updated look that matched the new feel of the logo and subsequent color schemes. WebTrax learned the intricacies of evolving a brand into a new version of itself. Open Communities did not start from scratch. They had a presence and a following, a community and staff, a vision and a mission. Our goal was to carry over this well-established organization and assist them in the fresh new look they had decided on. Read more about WebTrax graphic design services. View more of our case studies. WebTrax provided ESOP Law with website design, professional writing & editing, and graphic design services. 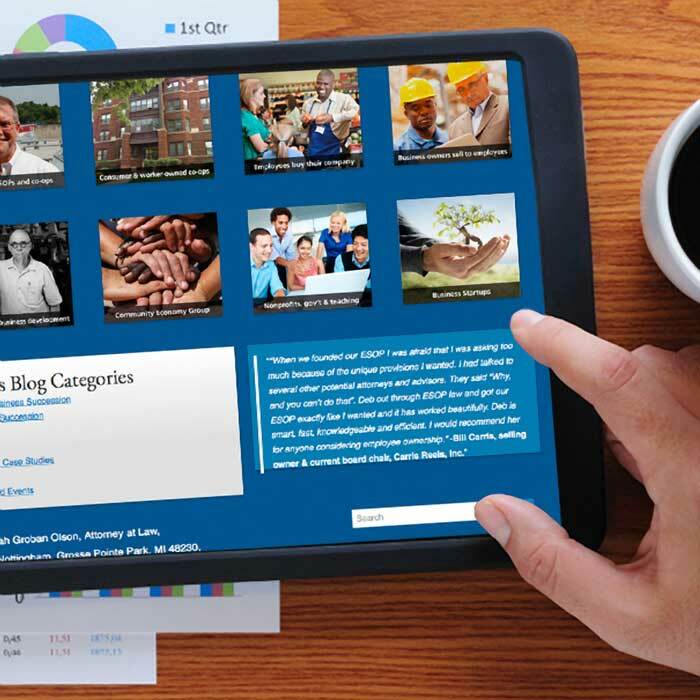 In the fall of 2013, Deb Olson of ESOP Law reached out to WebTrax for a website overhaul. 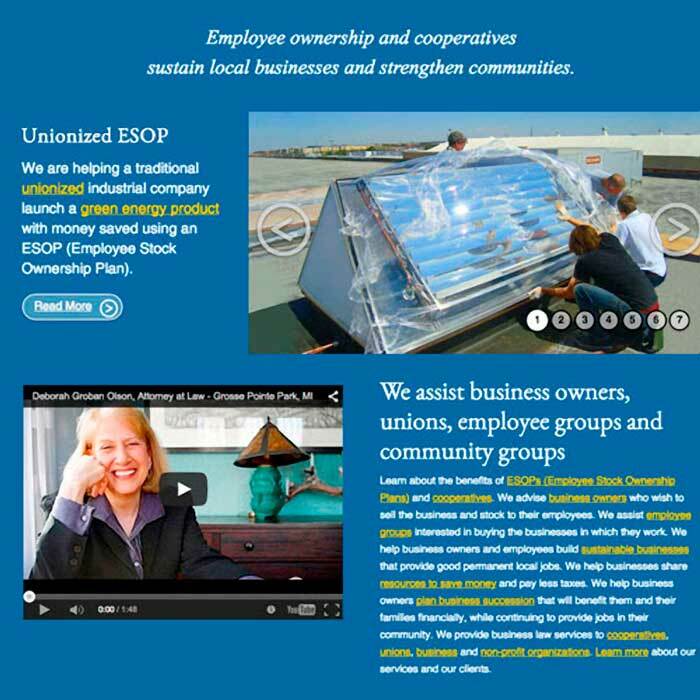 At the time, the ESOP Law site was outdated in terms of design, content, and navigation. The client was seeking not only a fresh and modern design but a website that fully offered all the information that needed to be shared. WebTrax concluded that the best website platform for the copious amount of information was a succinct Wordpress layout. The site homepage showcases the select topics covered throughout the site, a welcoming video of Deb Olson herself, a brief overview of the site contents, a blogroll, resource links, and a grid of the client services offered. Given the amount of information divulged onto the site, it was critical to express as much as we could on the homepage alone. For someone fully interested in ESOP Law, it was imperative for them to be given the options contained within the site. The main menu navigation bar contained many dropdown menus. For a site visitor, it may appear daunting to have so many options, so the homepage laid out these various sections in a more visual way. 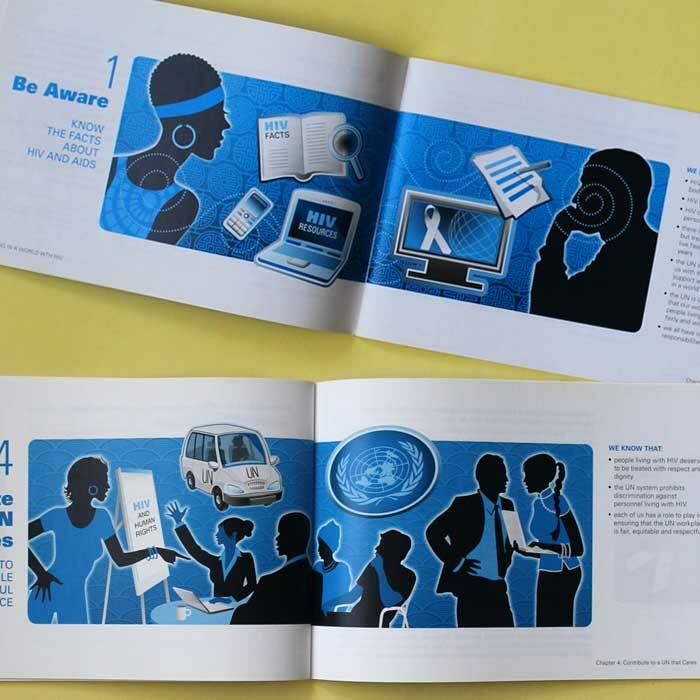 The included brochures designed by WebTrax were “take-away” resources that provided curious visitors with something tangible. These same brochures were used as handout materials for Deb Olson in the presentations. 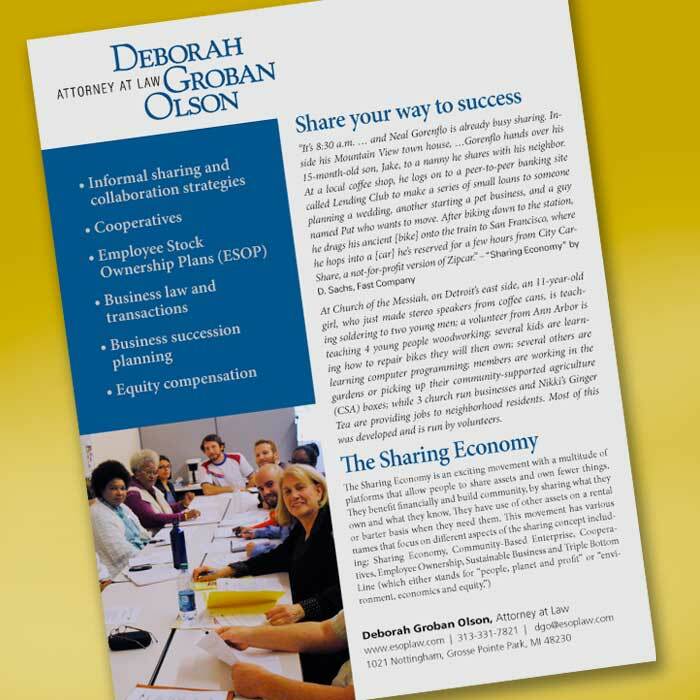 We were fortunate to work with Deb Olson on this site, because she had so much information that she wanted to share. From there, it was a matter of understanding what ESOP law actually was so that we could present that to an audience who may not know. After many conversations and reading through the content, we were able to agree on an efficient site layout that makes navigating throughout topics very simple. We learned the importance of categorizing information to make the process of displaying information much easier. Read more about WebTrax website design, writing & editing, and graphic design services. View more of our case studies. WebTrax provided UN Cares with website design, graphic design, and branding services. Dating back in the summer of 2004, WebTrax began a long-term, trusting relationship with a subsect of the United Nations, UN Cares. 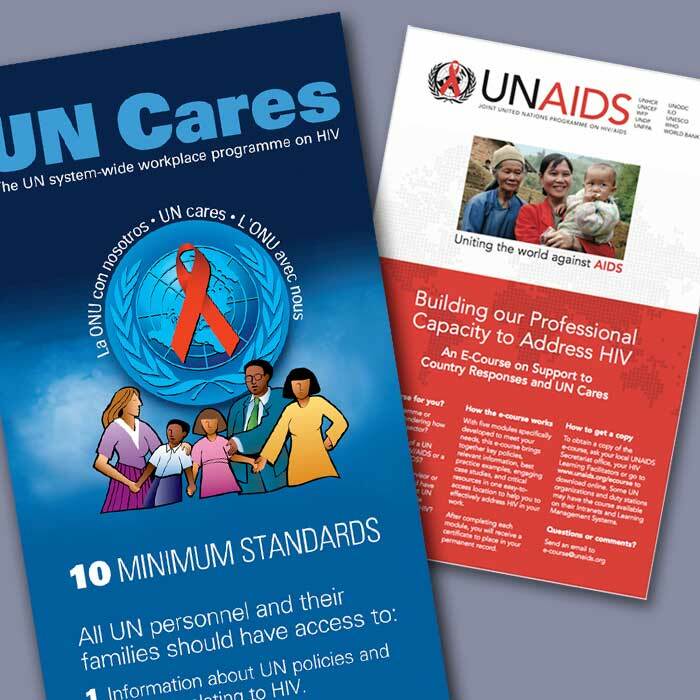 UN Cares is a sector developed for UN personnel and their families that demonstrates how to responsibly respond to and educate about HIV/AIDS. In its development stages, UN Cares reached out to WebTrax for designing both public and private community websites, a rebranded updated logo, and various branded material. After developing websites that not only successfully published UN Cares information but were easily navigable, WebTrax worked on auxiliary materials. WebTrax proudly continues to develop these materials as needed: brochures, handouts, and pamphlets. Most recently in 2014, WebTrax designed a slew of UN case studies for their highlighted countries, which involved multilingual design (French and Spanish). Throughout the years, WebTrax has been able to assist UN Cares with any design needs that they require. We have built a long-lasting relationship with them: we understand their mission and they understand our efforts to serve the non-profit sector. More than 10 years in, our strong working relationship has been expressed through the many works we have executed together. Read more about our website design, graphic design, and branding services. View more of our case studies. WebTrax provided Millennia Consulting with website design (Squarespace) and social media consulting. In the spring of 2014, WebTrax began working with Millennia Consulting on a website overhaul and marketing development. The previous website design was dated compared to the new design aspects that Millennia had began to use. Due to the simplicity of the site needs and the modern, updated look the company was looking for, we migrated the Joomla site to a Squarespace one. The new Squarespace site offered a bright and clean layout. Although very similar to the previous site, the simplified color scheme and fewer block elements made the new site feel less cluttered. In line with the site overhaul, Millennia decided to learn about how social media could work for them. Members of the Millennia team took a short course in understanding the basics of various social media platforms. Millennia has developed a presence on Facebook and Twitter, and has begun blogging, as it has continued sending out newsletters. Within 2014, WebTrax had been progressively working in Squarespace. 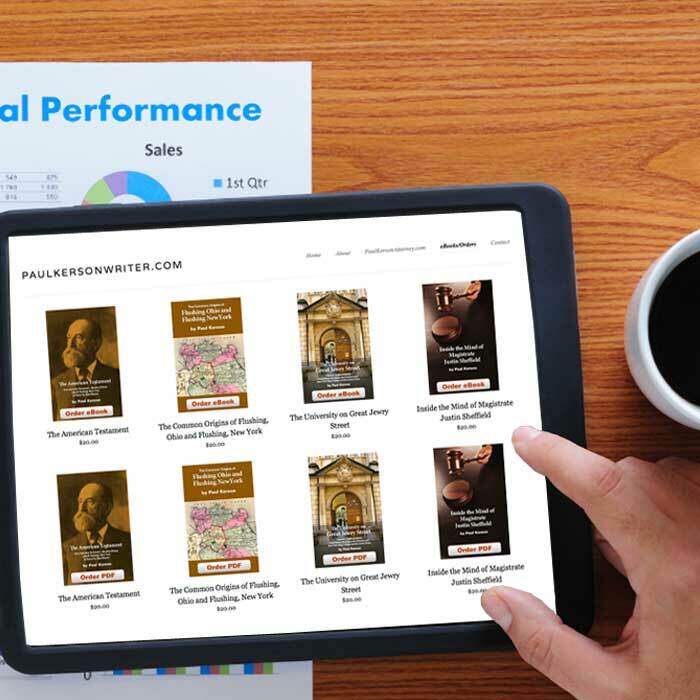 For many sites, such as Millennia, we believed the platform was effective and exciting for the client. With minimal training time, Millennia was able to make changes and updates to the site on their own. We learned how to engage our clients with this new platform and how to embrace the rise of social media. Overall, we had a great experience helping Millennia move forward with their vision for the company. Read more about WebTrax website design and writing & editing services. View more of our case studies. Click on thumbnails to expand images. WebTrax provided Paul Kerson (Writer) with e-commerce web design and graphic design services. 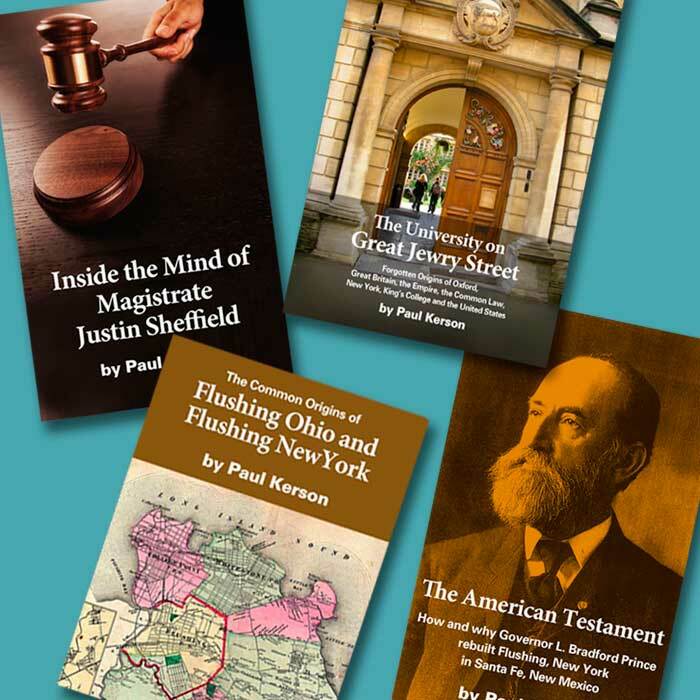 Paul Kerson, a successful attorney, is also an accomplished writer of fiction and non-fiction. Late in the summer of 2014, he wanted to showcase his writing works in an e-commerce site. WebTrax decided that a Squarespace site would fit his needs. 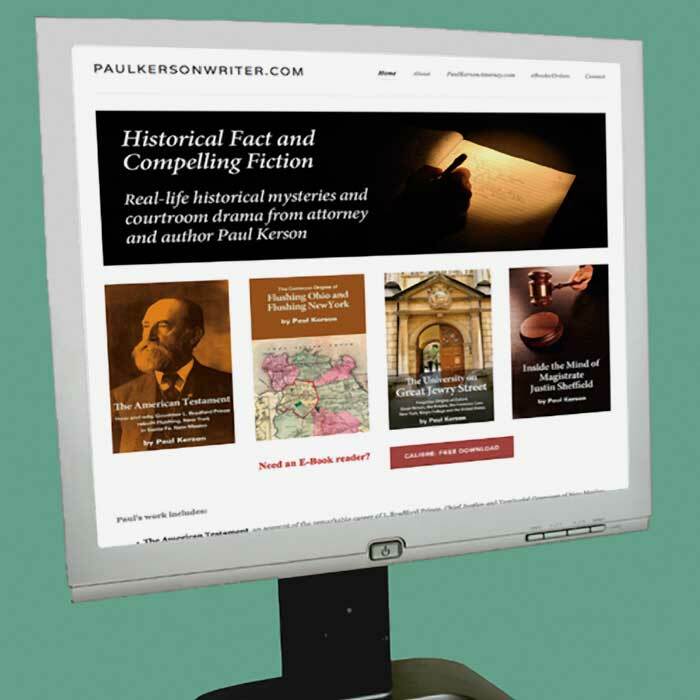 The Paul Kerson Writer website needed to offer e-books and pdf downloads. WebTrax designed a very minimal and direct site where consumers could easily download e-books and PDFs, based on their preference. The site also offers bundle downloads. WebTrax was able to design download buttons that made it very clear which versions the consumer was purchasing. We also added links to an e-book reader for those who preferred it. 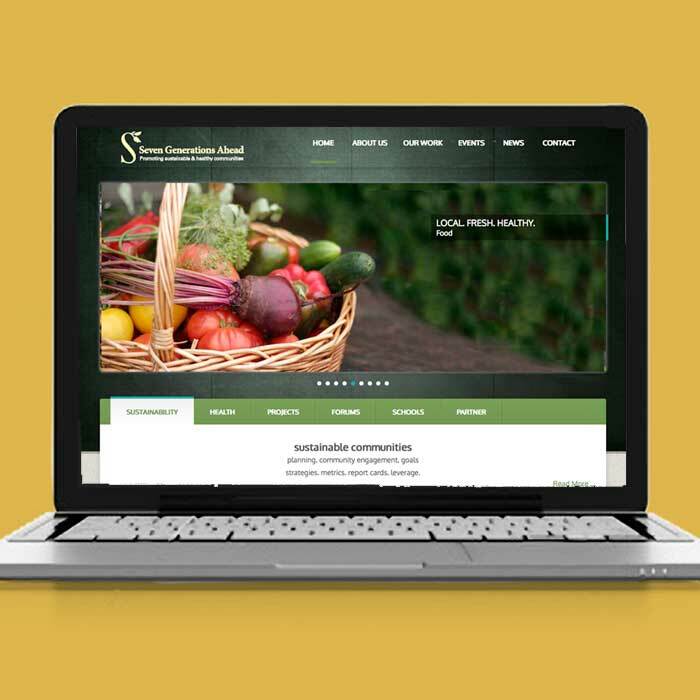 We were able to work with the client on filling out the information needed for running an e-commerce site on Squarespace. At the time of site design, Squarespace solely offered Stripe as a commerce payment processor. In order to keep site visitors on the website without leaving to a third-party page or a PayPal secondary window, Stripe and Squarespace offered a succinct and hassle-free solution. We learned about the many e-commerce capabilities built into a Squarespace site that may be used for future clients. Read more about WebTrax website design and graphic design services. View more of our case studies.